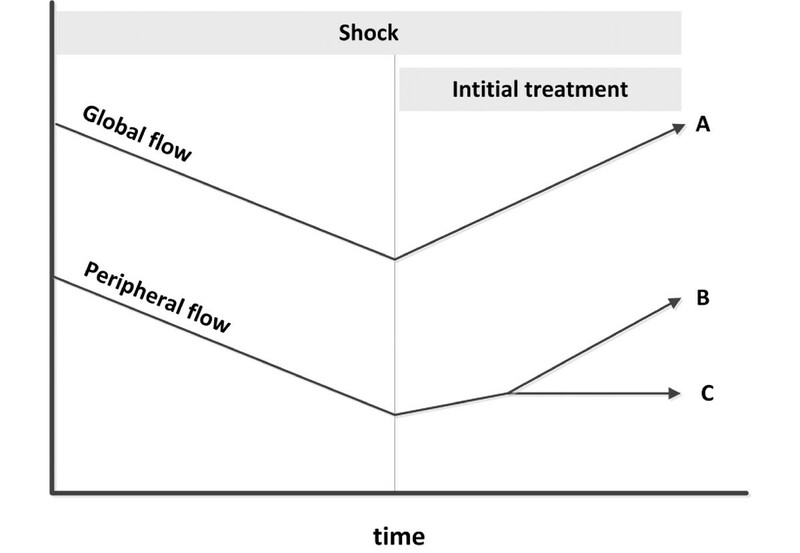 Irrespective of initiating factors, the peripheral circulation shows two general phases during the development and treatment of shock. Most published reports support earlier knowledge that the peripheral circulation is among the first to deteriorate and the last to be restored. With the advent of new and old techniques that allow us to continuously monitor peripheral perfusion, we may further shift our focus from pressure-based to flow-based resuscitation. The persisting challenge is the validation (effect on outcome parameters) of peripheral perfusion monitoring tools that can be simple and readily available worldwide. Despite enthusiasm raised by new hemodynamic monitoring systems, a large gap still exists between what we can measure and what we would really like to measure. The report in a previous issue of Critical Care by He and colleagues on two techniques for peripheral perfusion monitoring adds new insights into this topic . In patients with septic shock, they studied the use of continuous transcutaneous oxygen, carbon dioxide tension and peripheral perfusion index (PI) derived from the pulse oximetry signal. Although these are not new technologies, their study highlights the importance of the status of nonvital organ perfusion in the resuscitation of patients with circulatory shock. Earlier observations on the behavior of nonvital organ perfusion have shown two phases during the shock state, irrespective of initiating factors . During the initial phase, compensatory mechanisms predominate to preserve the perfusion of vital organs at expense of the peripheral tissues (nonvital organs). As blood flow variations in this phase follow a similar response pattern in the skin, subcutaneous tissue, muscle and gastrointestinal vascular beds, these tissues are highly sensitive for detecting occult tissue hypoperfusion during compensated circulatory shock. Although these are functionally and metabolically different organs, at a functional circulatory level they are remarkably similar. Blood flow in these organs is moderately to strongly influenced by sympathetic vasoconstrictor mechanisms. In this regard, coronary, cerebral, and renal circulations show a high degree of autoregulation with poor sympathetic control, whereas skeletal muscle, gastrointestinal and cutaneous circulations show a predominant sympathetic control with a poor degree of autoregulation. With the progression of circulatory shock and following initiation of therapy and normalization of systemic hemodynamic parameters, the association between global flow and peripheral circulation becomes less striking and ultimately disappears. Some patients enter a phase where the physiological gap between macrocirculation and microcirculation becomes more evident and intricate(Figure 1). To what extent each peripheral vascular bed expresses hypoperfusion in these stages of shock remains to be investigated. Nevertheless, most published reports support our earlier knowledge that the vascular bed of peripheral circulation is among the first to deteriorate and the last to be restored after resuscitation and, therefore, through this being a window of perfusion . Clinical pattern of alterations in global and peripheral blood flow during circulatory shock. After initial treatment, restoration of global flow (A) is usually followed by peripheral perfusion trends towards normalization in survivors (B), and remained altered in nonsurvivors (C). Poeze and colleagues observed that global hemodynamic variables and gastric tonometry variables were both different between survivors and nonsurvivors, and no superior predictor of outcome was identified at admission before ICU resuscitation was initiated . However, after stabilization and normalization of global hemodynamics, gastric tonometry variables were the best predictor of outcome. Other studies have reported similar time courses in different peripheral vascular beds, such as skin, muscle and sublingual microcirculation. These studies showed that persistence of abnormal peripheral perfusion following restoration of global hemodynamics was related to an unfavorable outcome [5–9]. Our group evaluated changes in parameters of skin and muscle perfusion during early resuscitation of circulatory shock [8, 9]. We found that patients who failed to normalize their capillary refill time, PI and peripheral tissue oxygenation during early treatment had a worse outcome. These findings could have implications for the treatment of critically ill patients with persistent abnormal peripheral perfusion, requiring additional diagnostic or therapeutic interventions. He and colleagues explored the relationship between global and peripheral perfusion variables following initial resuscitation in septic patients . The authors used two distinct but complementary methods to evaluate peripheral perfusion (PI and transcutaneous oxygen/carbon dioxide tension). The PI calculates the ratio between the arterial compartment and the nonpulsatile component and because the size of the pulsatile portion increases with vasodilation and decreases with vasoconstriction, changes in the PI reflect changes in peripheral blood flow. Transcutaneous oxygen/carbon dioxide tension, on the other hand, is a measure of oxygenation, and is related to variations in local perfusion . The authors demonstrated that nonsurviving septic patients had poor peripheral perfusion characterized by lower PI and a blunted response to the oxygen challenge test (OCT; the change in transcutaneous oxygen tension relative to the change in arterial partial pressure of oxygen after 10 minutes on fraction of inspired oxygen of 1.0). The authors also showed that the PI and OCT could predict mortality with similar accuracy to arterial lactate levels, although not corrected for confounding factors. Interestingly, the study showed that both survivors and nonsurvivors had abnormal peripheral blood flow, as reflected by the lower PI values, when compared with healthy controls. Even more interestingly, nonsurvivors had significantly lower OCT values associated with higher arterial lactate levels. Assuming that global hemodynamic variables were optimized in all patients, the low OCT in the nonsurvivors could be explained either by a high rate of oxygen consumption or by decreased oxygen delivery, as hypothesized by the authors. Since oxygen requirements of the skin are quite low relative to other organs, we can speculate variations in peripheral blood flow as the main reason of low OCT in nonsurvivors, supported also by the low PI values. These results underscore the context of the peripheral circulation in septic shock, and provide evidence of a heterogeneous distribution of blood flow in sepsis. This phenomenon was first described by Gilbert in 1960 as 'dilation in one (vascular) bed might be accompanied by constriction elsewhere’ . This statement is supported by the findings of He and colleagues showing that peripheral vasoconstriction can be a hallmark of early septic shock . While these abnormalities in peripheral perfusion predict an unfavorable outcome, it still needs to be proven that correcting these abnormalities results in improved outcome. As clinicians we start shifting our focus from monitoring global pressures to monitoring flow and its determinants in order to assess adequacy of resuscitation [12, 13]. With the advent of techniques that allow us to continuously monitor peripheral perfusion, we could further shift our focus to maintaining normal perfusion in nonvital organs, such as skin, subcutaneous tissue and muscle. The fundamental challenge is the validation of low-cost peripheral perfusion monitoring tools that can be readily available worldwide. The measurement of transcutaneous and sublingual microcirculation at the bedside is still mostly used in larger research centers. Reliance on simple methods such as the capillary refill time, skin temperature, and PI must be emphasized and exploited. However, the true clinical implications of these tools should be better defined in clinical trials targeting peripheral perfusion.